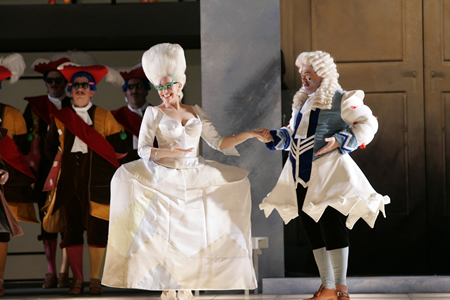 Cinderella (Joyce DiDonato) meets Dandini (Earle Patriarco) who is disguised as the Prince. Cinderella may be an old-as-the-hills tale, but when the famed Barcelona theater company known simply as Els Comediants got a hold of it, it’s something to behold. With this wildly imaginative troupe at the helm, The Houston Grand Opera production of Rossini’s Bel Canto favorite, La Cenerentola, looked and sounded good enough to eat. The Comediants team for this production included director Joan Font, set and costume designer Joan Guillén, lighting designer Albert Faura, and choreographer Xevi Dorca. Together they put on the most original and delightful version of Cinderella I have ever seen, and that includes opera, ballet, film, and any Disney-fication of the story. Comediants places Angelina/Cinderella and the evil sibs in what looked like a sleek grey Soho loft, furnished by choice pieces from Pee Wee’s playhouse. Six crafty steel-snouted mice keep the humor high nearly stealing the show in the process. (The mice running the wind machine off on the side of the stage was hilarious.) This swift little band of rodents busy themselves moving the set about, keeping our Cinderella company, and reacting to everything around them. Comediants takes eye candy to new confectionary heights with these wild and wooly antics. The staging, rich with visual cleverness, made one hilarious re-telling of this familiar tale. Oh yes, there was singing too. Most notably, HGO studio alumna turned international star, Joyce DiDonato looked smashing in her Mondrian-inspired tattered black grey and white rags, and sounded glorious as she ripped through Rossini’s coloratura passages with virtuosic glory. Her bright sound and perky presence provided a perfect match for Comediants whimsical palette. DiDonato handled the comedy with deft ease as well. Patrick Carfizzi’s magnificent Don Magnifico charmed with ample buffoonery and zany wit. Earle Patriarco’s valet-disguised-as-a-prince Dandini delivered an over-the- top performance and also showed off considerable flair in his flamenco moves. Who needs a fairy godmother when there is a philosopher in the house? With Russian bass Nikolai Didenko’s portrayal as the mentor, guide, and sorcerer, Angelina is in capable hands. Soprano Tamara Wilson and mezzo-soprano Catherine Cook played Clorinda and Tisbe, the evil and fashion-challenged step sisters, with great humor, verve, and full bodied vocal skills. With wigs taken right out of Marge Simpson’s closet and inner tube underwear, these two were a hoot. The HGO men’s chorus sang and performed precision moves like a pros. Making his HGO conducting debut, Edoardo Müller led the HGO orchestra with amble flair and confidence. But let’s get back to the mice. They were terrific. Where do I apply?